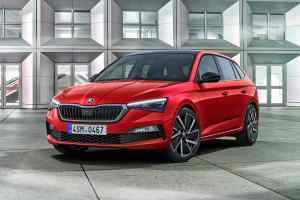 The new Skoda Scala is the Czech firm’s first direct rival to the Ford Focus, Vauxhall Astra – and its Volkswagen Group siblings, the Seat Leon and Volkswagen Golf. 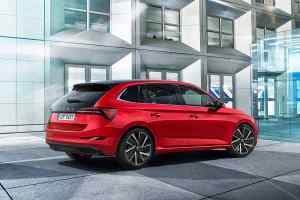 The five-door family hatchback replaces the dreary Rapid and is a much more appealing value-priced contender from the fast-growing brand. 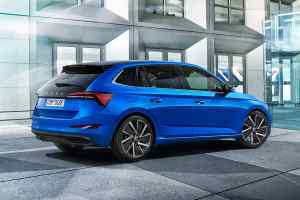 And although the Scala sits between the Fabia supermini and Octavia large family car, Skoda isn’t shy on the internal comparisons. The Scala is a very roomy car indeed. 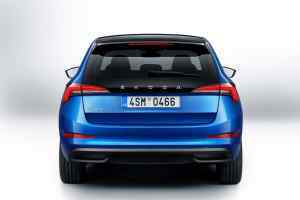 It has, for example, identical 73 mm rear kneeroom as the Octavia. Elbow room of 1,425 mm isn’t far show of the Octavia’s 1,449 mm. Headroom of 982 mm actually betters the Octavia’s 980 mm. 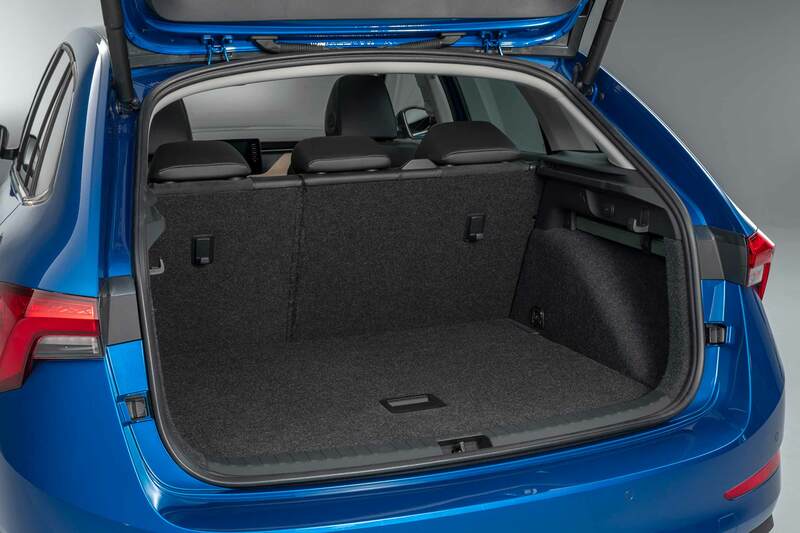 And the boot may not be as large as the Octavia’s famously cavernous luggage bay but it’s still bigger than anything else in the segment. By far: 467 litres is way larger than a Volkswagen Golf’s 380 litres. It extends to 1,410 litres with the seats down. The packaging skill becomes more impressive still when you clock the dimensions: it’s 4,362 mm long, which compares closely to the 4,255 mm of a Golf. It’s 1,793 mm wide (a Golf is 1,799 mm) and 1,471 mm tall, with a long 2,649 mm wheelbase. 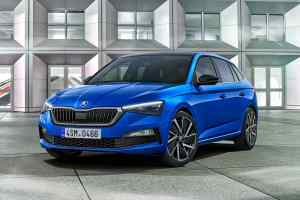 The Skoda Scala goes on sale in spring 2019. What does the name Scala mean? Scala is derived from Latin: it means ‘stairs’ or ‘ladders’. 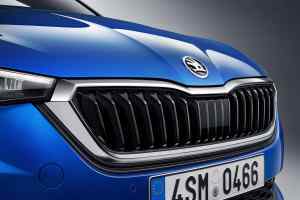 Skoda’s picked it because, ahem, the brand “has climbed several rungs on the development ladder. “It perfectly embodies a set of brand values which can be summarised very well under the term ‘smart understatement. Bosses also proudly point out this is its first car to have the brand name written out in letters on the (black glass) tailgate. 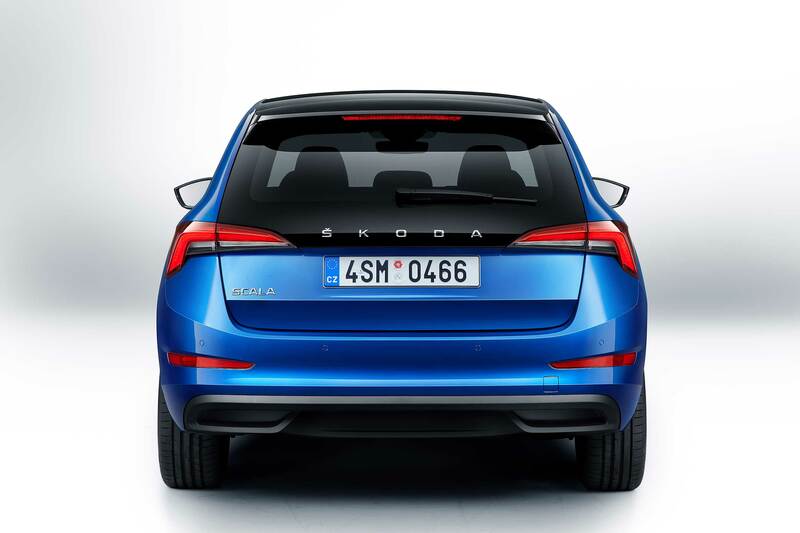 SKODA is coming to the rear end of all models in the future. 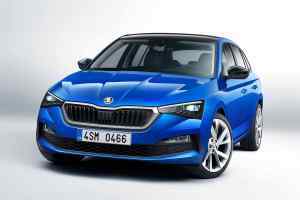 The Skoda Scala will, in the UK, be offered with four different engines – three petrols and a diesel. All are turbocharged and all have engine stop/start. 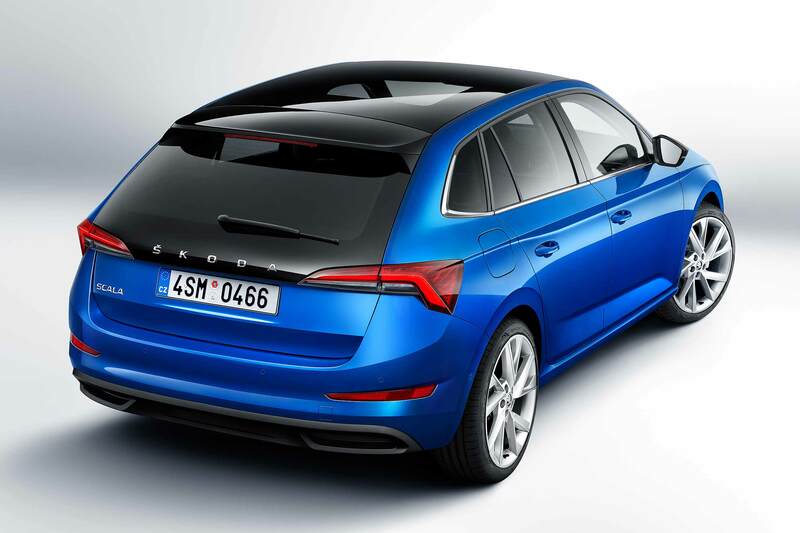 The entry-level 1.0 TSI produces 95hp and is paired with a five-speed manual gearbox. 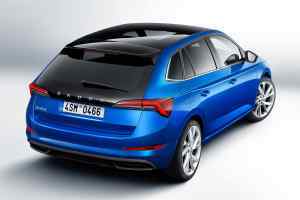 There’s a more powerful 1.0 TSI 115, which has a six-speed gearbox as standard, or a seven-speed DSG as an option. Volkswagen Group’s outstanding 1.5 TSI 150 is also available – again with a six-speed manual or seven-speed DSG. And, although diesel is hardly flavour of the month, a 1.6 TDI 115 is also available. Again, it’s either six-speed manual or seven-speed DSG. 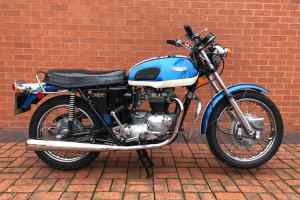 The exhaust emissions are cleaned up by a diesel particulate filter, SCR catalyst and AdBlue injection. 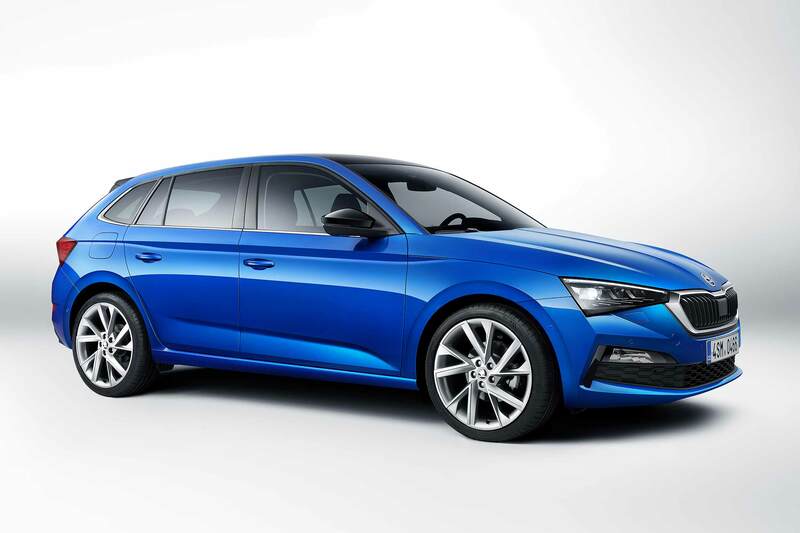 In Europe, Skoda Scala buyers have an additional engine – a 1.0 G-TEC, which runs on compressed natural gas (CNG). Sadly, we won’t get it in the UK, as we don’t have a refuelling infrastructure for clean-burning CNG. Pity. 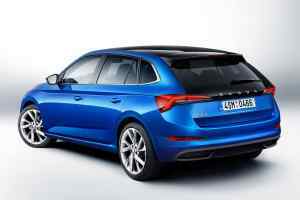 Skoda adds the Scala will come with an optional Sport Chassis Control. This is lowered 15mm and has adaptive dampers to offer a firmer Sport mode as well as a softer-riding Normal setting. 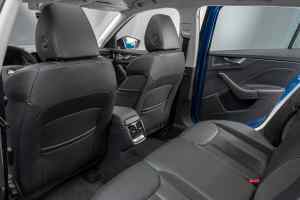 Skoda has already revealed the interior of the Scala. It’s a big step on for the value brand, that head of interior design Norbert Weber says marks the introduction of its new interior concept. This “introduces an updated design language alongside new colours and materials. 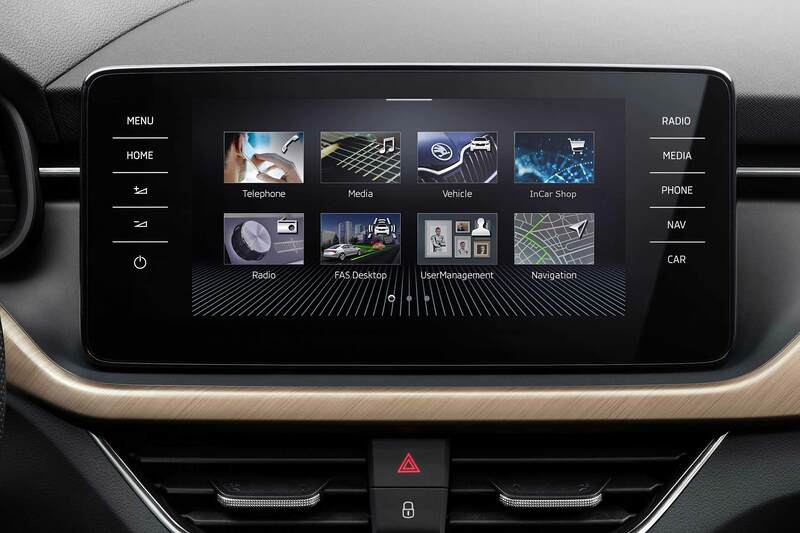 Highlights include the freestanding infotainment screen in the centre, which can be as large as 9.2 inches. This makes it the biggest touchscreen in the family hatch sector. 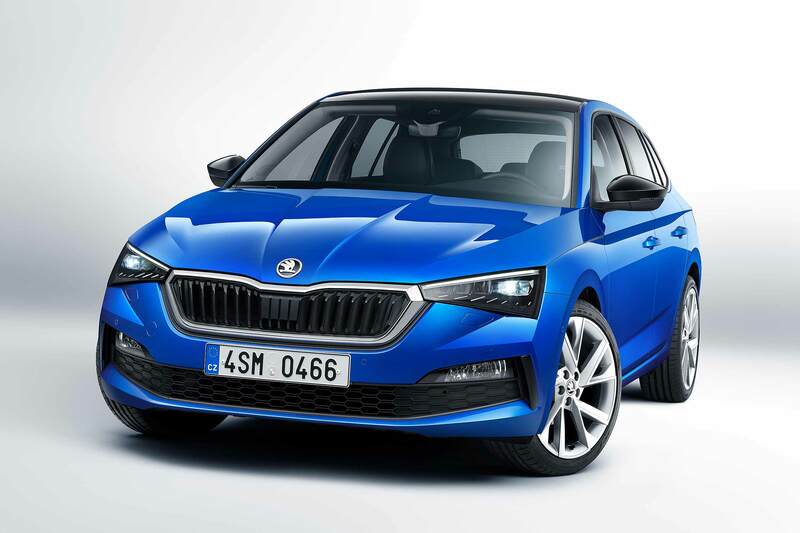 It’s the first Skoda to be ‘always online’ courtesy of an embedded eSim. This enables owners to use Skoda Connect mobile online services: they’ll be able to check their fuel level whether their car’s locked, or simply where it is, via an app on their smartphone. 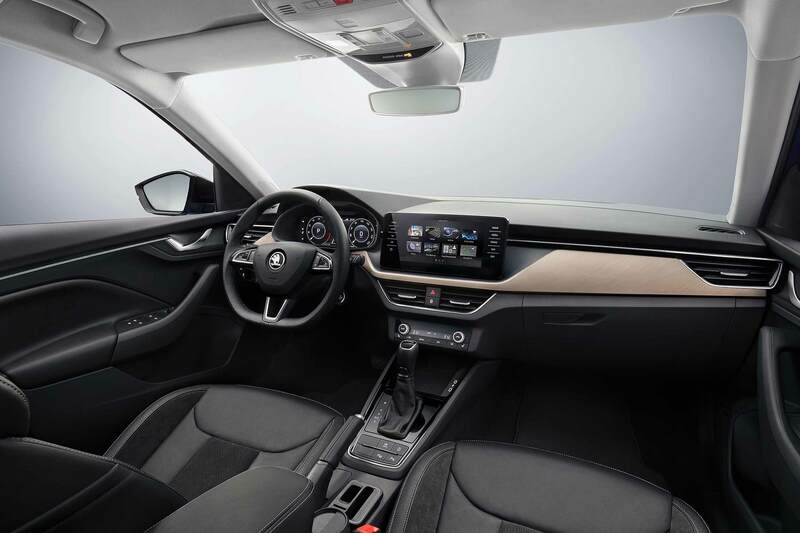 The instrument panel and door trims are made from soft-touch plastics which feature a new ‘crystalline’ grain structure that’s coming to all Skodas in the future. 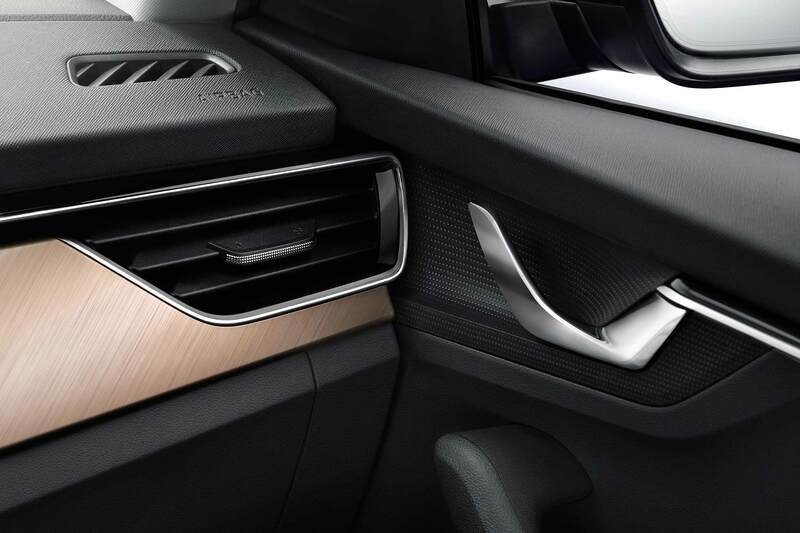 The firm’s also proud of how the air vents extend into the door panels, giving an impression of width within. LED ambient lighting is available, as are up to nine airbags. The windscreen, steering wheel and both front and rear seats can all be heated. 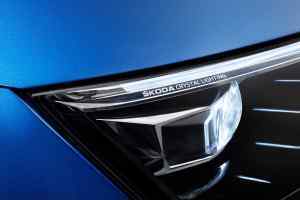 Skoda loves its Simply Clever features. Like most of its cars, the Scala gets an umbrella compartment in the driver’s door (yes, it includes a free umbrella). It also has a fluorescent yellow ice scraper built into the fuel filler flap. A new feature is an electrically retractable tow bar, which whirrs in and out of the rear bumper via a button in the boot. There’s also an electric tailgate with ‘tip-to-close’ function. 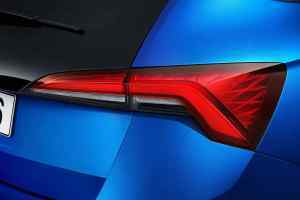 A more ‘Simply Audi’ feature is standard LED headlights; LED tail lights are also included, with a very Audi-style ‘sweeping’ indicator function. 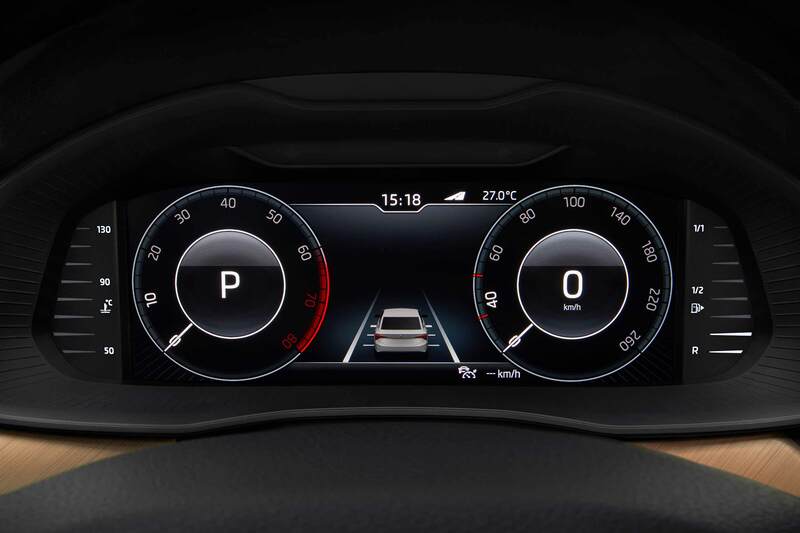 Speaking of Audi, Skoda’s offering the 10.25-inch Virtual Cockpit as an option. 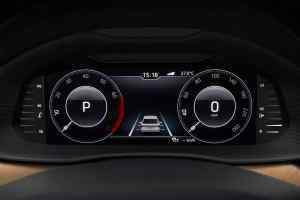 This is the ‘digital instrument panel’ first seen in the Audi TT. Side Assist is also clever. It’s a step on from blind spot assist: that can only spy cars up to 20 metres away, whereas Side Assist can ‘see’ them up to 70 metres away. It can therefore warn the driver of fast-approaching cars from far further away, potentially avoiding nasty rear-end crashes. Adaptive Cruise Control, Rear Traffic Alert, Lane Assist and Front Assist are also available, along with City Emergency Brake. 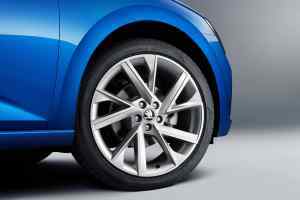 And for those who like big wheels, 15-inch and 16-inch rims are joined by 17-inch and 18-inch options.